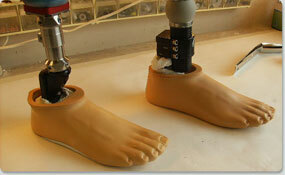 Lower extremity prosthetics replace limbs located at the hip or lower. 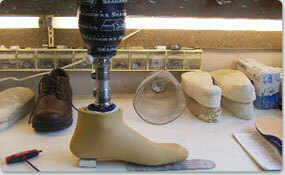 There are two main types of lower extremity prosthetics, trans-tibial and trans-femoral. Trans-tibial concerns amputation or injury transecting the tibia bone. Trans-femoral concerns amputation or injury transecting the femoral bone. Trans-tibial prosthetics refers to below the knee (BK) prosthetics and trans-femoral prosthetics refer to above the knee (AK) prosthetics. Preferred O & P Services provides expert lower level prosthetic care to patients suffering from lower extremity limb loss. Patients may suffer lower level amputations due to injury or disease. Preferred O & P Services works closely with our prosthetic patients to help them adjust to living with artificial limbs. Hip disarticulation occurs when a patient has an amputation or anomaly at or in close proximity to the hip joint. Knee disarticulation occurs when the patient has an amputation or anomaly through the knee. Symes is an ankle disarticulation with a preserved heel pad. Lower extremity prosthetics replace limbs lost due to hip, knee or ankle disarticulation. Innovations in mechanical devices and prosthetic technology provide patients with new advances and greater functioning with artificial limbs. Preferred O & P Services practitioners incorporate new technologies to provide the best care for their patients.